The VOIP and video conference market is just starting to gain traction in the mainstream. Today, if you want to video conference, then you’ll typically have to use a desktop device (computer, video conferencing phone, etc..). That all might change, however, with the release of the next iteration of iPhones. 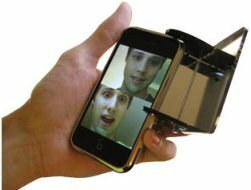 The iPhone OS 3.2 has support for video calling and conferencing. If the iPhone does in fact hit the market, I’m predicting that the current video conferencing market as we know it will instantly be shaken at the foundation, and the majority of start-ups who are trying to get a foothold into this marketplace will be faced with some tough decisions about their business.